Submitted photo Dave Reichert was sworn-in March 27 to serve as the Fairborn Fire Department fire chief. He is the eighth fire chief to serve the City of Fairborn. Reichert formerly served as the department’s division chief. The city is currently seeking an individual to serve as division chief. Dave Reichert was sworn-in March 27 to serve as the Fairborn Fire Department fire chief. He is the eighth fire chief to serve the City of Fairborn. Reichert formerly served as the department’s division chief. The city is currently seeking an individual to serve as division chief. 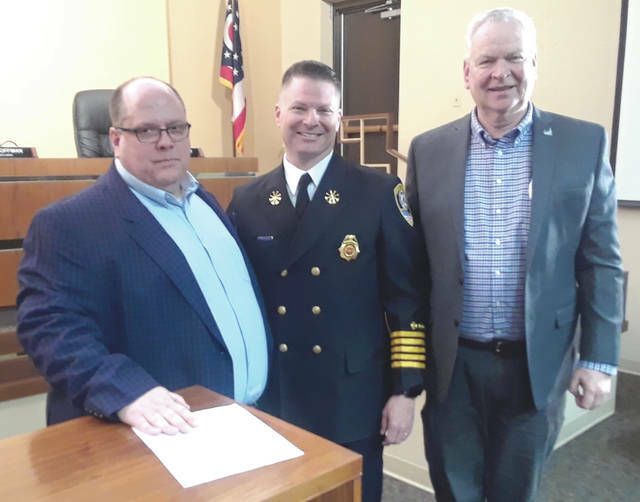 https://www.fairborndailyherald.com/wp-content/uploads/sites/50/2019/03/web1_chiefswearin.jpgSubmitted photo Dave Reichert was sworn-in March 27 to serve as the Fairborn Fire Department fire chief. He is the eighth fire chief to serve the City of Fairborn. Reichert formerly served as the department’s division chief. The city is currently seeking an individual to serve as division chief.